Hasn’t she let herself go since becoming PM? History: Henry VIII was a brickie and did Charles II start the Great Fire of London? Painstaking research by Harold don, Professor Bethany Russell, has revealed that Henry VIII, famous for having six wives, was also a first class bricklayer who played an active part in the building of many of the great palaces attributed to him. According to recently discovered papers, there was nothing he liked better after a hard day conducting the affairs of state, than to spend a couple of hours working on the intricate brick tracery of Hampton Court Palace with a trowel in his hand. 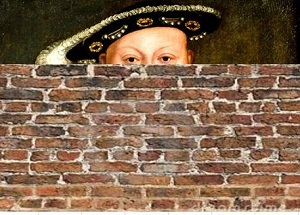 Comments Off on History: Henry VIII was a brickie and did Charles II start the Great Fire of London? The naked version of Henry VIII always rose to the occasion. Historian Dan Cruickshank has denied ‘dumbing down’ in his new series, ‘A Nuddy History of Britain’. Cruickshank hastily re-edited a pilot show for his new project, which explored complex family trees, socio-economics and the inherent political injustice of the day. Instead, the show now features writhing, sweating bodies, several gallons of baby oil and rubber masks that look a bit like famous royals.